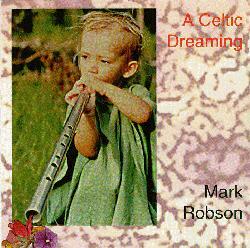 I recorded "A Celtic Dreaming" during the year following the birth of my daughter, Tahli (see front cover.) I've always regarded it as a celebration of her arrival into the world and into my life, and a celebration of birth in general. The final section "Water Baby Dreaming" was written and recorded during the days either side of her birth. The other main sources of inspiration for this music was, as the title suggests, the meeting of two cultures - those of Australia and Britain - Celtic and Australian aboriginal. This wasn't planned consciously - it was just the way it turned out. Somehow it was no great surprise to find that the two musics could meet and exist together so comfortably. It's all one world after all. I didn't realize at the time but "A Celtic Dreaming" was the start of something quite large for me - it was soon after it came out that "Kangaroo Moon" came into existence, and has been growing and thriving ever since. David Williams was there with me for all the sessions in Thorn - he played all the stringy bits and helped write and improvise those tracks. Matt Ledgar popped in and went "swish" on a couple of cymbals before disappearing overseas. And Elliot Mackrell would have been there if London wasn't so far away. To all who played on the album, and who helped in any way I am very grateful. I feel like I learned a lot during this time - I even grew up a bit. My special thanks to Tahli for dripping in and to Robyn without whom it would have all been very different…….. This music is dedicated to them, and also my parents, and everyone's parents, and everyone's kids. Love Mark.